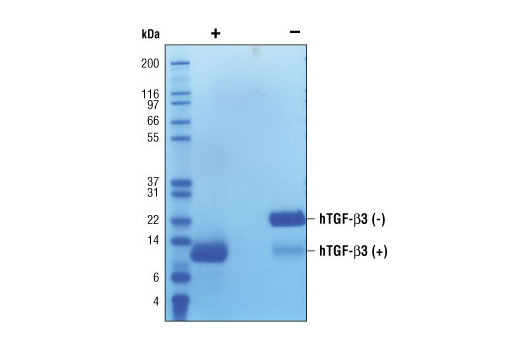 The purity of recombinant hTGF-β3 was determined by SDS-PAGE of 6 µg reduced (+) and non-reduced (-) recombinant hTGF-β3 and staining overnight with Coomassie Blue. The inhibition of IL-4 induced proliferation in HT-2 cells treated with increasing concentrations of hTGF-β3 was assessed. After 48 hour treatment with hTGF-β3, cells were incubated with a tetrazolium salt and the OD450-OD650 was determined. 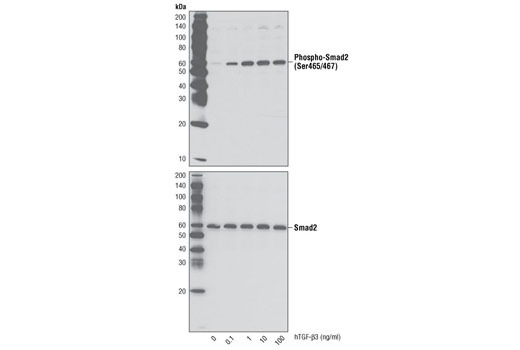 Western blot analysis of extracts from HeLa cells untreated or treated with hTGF-β3 for 30 minutes, using Phospho-Smad2 (Ser465/467) (138D4) Rabbit mAb #3108 (upper) and Smad2 (86F7) Rabbit mAb #3122 (lower). Recombinant human TGF-β3 (hTGF-β3) Ala301-Ser412 (Accession #NP_003230) was expressed in human 293 cells at Cell Signaling Technology. >98% as determined by SDS-PAGE of 6 μg reduced (+) and non-reduced (-) recombinant hTGF-β3. 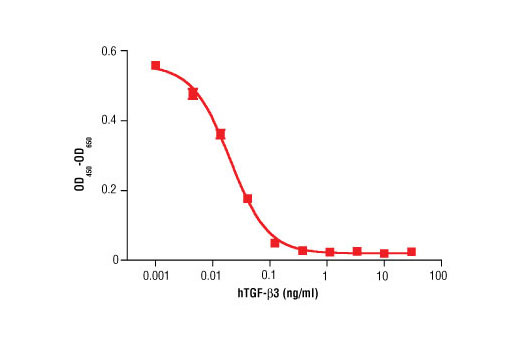 Less than 5% migrates as monomer hTGF-β3 under non-reduced (-) conditions. All lots are greater than 98% pure. Recombinant hTGF-β3 contains no "tags" and the nonglycosylated protein has a calculated MW of 12,722. DTT-reduced protein migrates as a 12 kDa polypeptide and the non-reduced cystine-linked homodimer migrates as a 22 kDa protein. The expected amino-terminal ALDTN of recombinant hTGF-β3 was verified by amino acid sequencing. The bioactivity of recombinant hTGF-β3 was determined by assessing inhibition of IL-4 induced HT-2 cell proliferation. The ED50 of each lot is between 0.02-0.1 ng/ml. Less than 0.01 ng endotoxin/1 μg hTGF-β3. With carrier: Lyophilized from a 0.22 μm filtered solution of 20 mM Citrate, pH 3.0 containing 100 mM NaCl and 20 μg BSA per 1 μg hTGF-β3. Carrier free: Lyophilized from a 0.22 μm filtered solution of 20 mM Citrate, pH 3.0 containing 100 mM NaCl. TGF-β3 can induce cell proliferation and angiogenesis, and can promote some immune events while inhibiting others (1-3). TGF-β3 is produced by chondrocytes, glial cells, astrocytes and some cancer cells (3,4). TGF-β3 binds to TβRII homodimer, which then complexes with TβRI homodimer (1,5). The oligomeric receptor complex phosphorylates subsets of SMAD proteins that then act to induce or suppress target genes (1,5). Based on knock-out studies in mice, TGF-β3 is critical for lung and palate development (6). Damstrup, L. et al. (1993) Br J Cancer 67, 1015-21. Constam, D.B. et al. (1992) J Immunol 148, 1404-10. Dünker, N. and Krieglstein, K. (2000) Eur J Biochem 267, 6982-8.